This image was captured when an elusive ocelot triggered a remote-action trail camera at a wildlife refuge in South Texas. Expanding the “wall” along the U.S.–Mexico border is controversial for many reasons, not the least of which is fear that it would harm the region’s wildlife and wildlife habitat. That concern is especially acute along the Texas stretch of the border, much of it the focus of decades of efforts to preserve rich biodiversity. Now, a group of Texas scientists details what they conclude would be significant effects of more barrier on the border. In a letter published in the April 2018 edition of the journal Frontiers in Ecology and the Environment, these scientists warn that “expanding the physical barriers along the southern border of the U.S. will have substantial negative effects on wild species and natural ecosystems,” including habitat destruction, habitat fragmentation, and ecosystem damage. Texas will be hardest hit, they add. The authors conducted a review of 14 scientific publications, including studies on effects of existing border barriers. They were Norma Fowler, Tim Keitt and Olivia Schmidt of the Department of Integrative Biology at the University of Texas at Austin; Martin Terry of the Department of Biology at Sul Ross State University and the Cactus Conservation Institute, both in Alpine; and Keeper Trout, also affiliated with the cactus institute. As proposed by federal officials, new border barriers and accompanying roads will destroy at least 4.8 to 7.3 acres of habitat per kilometer, not including construction sites, new roads to reach the barriers, or edge effects on adjacent land, the Texas scientists noted, based on a 2008 Department of Homeland Security report. An ecosystem of particular concern exists only in remnants along the river in South Texas – Tamaulipan thornscrub, home to the endangered Zapata bladderpod wildflower and endangered ocelot, they write. Physical barrier cannot be built in the Rio Grande floodplain, so some sections would be inland from the river, some more than a mile. This will keep wildlife from reaching the water and isolate from the rest of the U.S. another important ecosystem, South Texas riparian habitat, which supports high levels of bird diversity, the authors caution. In West Texas, a population of threatened whiskerbush cactus in Big Bend National Park lies in the likely path of barrier. Habitat fragmentation caused by the barrier will affect animals that cannot or will not cross barriers and roads, the authors warn, and plant species whose pollinators or seed dispersers do not cross the barriers. Species with populations on both sides of the border will end up as smaller, isolated populations, increasing the probability of local or complete extinction, the letter points out. 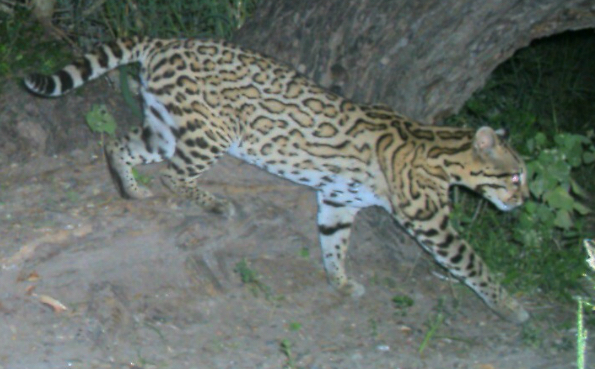 Habitat fragmentation already isolates two remaining ocelot populations in South Texas from each other and from the population in Mexico, resulting in loss of genetic variability. If a new barrier separates black bears in Big Bend National Park from those in Mexico, the park population is too small to persist on its own, the authors report. The scientists also express concern about effects on the border’s recreation and ecotourism industries. In 2011, ecotourism generated an estimated $344 million or more in economic activity in the Lower Rio Grande Valley alone – the four-county region at the southernmost tip of Texas. The letter urges environmental reviews for each proposed barrier section, even though the project is exempt from such reviews. It also encourages reducing negative effects by limiting the extent of physical barriers and associated roads, choosing designs that permit animal passage, and using less biologically harmful methods, such as electronic sensors instead of physical barriers. Existing physical barrier covers about 100 miles of the Texas border with Mexico. While Congress exempted the Santa Ana National Wildlife Refuge from new barrier, more miles are set to be built on other federal lands, including parts of the nearby Lower Rio Grande Valley National Wildlife Refuge. Melissa Gaskill, an independent journalist based in Austin, is a contributing editor for Texas Climate News.